We were fortunate to conduct at wine tasting on a boat in the harbour of St. John’s a few years back….but this info might still come in handy should you find the urge to visit our new favourite place. • The new ART GALLERY called ‘The Rooms’ is a must visit. It’s also a museum, has a café, and great vistas of the harbour and neighbouring buildings. • The HARBOUR-SIDE WALK up to Signal Hill is also a must. So intimate it takes you across someone’s front deck. • AUNTIE CRAE’S, 272 Water St, is a charming, old world meets new world, high-quality food store and café. Excellent espresso counter at the back. • The LIQUOR STORE on Water Street doesn’t look like much but go exploring and you’ll find one of the best wine offerings anywhere. Every great French or Italian wine you ever read about is not only on the shelf, but often in several vintages and, in different bottle sizes. And at reasonable prices. Excuse me Mr LCBO, your Summerhill flagship is a great building, but the wine selection cannot hold a candle to this. And it’s in a town of less than 100,000 people. • Yes, it’s true that George Street does have more bars than anyone could visit. Including the just opened, YELLOW BELLY BREW PUB. Canada’a best brewer, LIAM McKENNA is back in action here after his Dublin experience where his beer was good that Guinness paid bar owners not to stock it. BLUE ON WATER is a smart, modern boutique hotel, restaurant, bar right by the harbour. 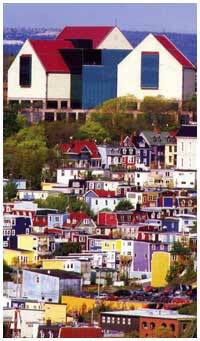 • THE BAD AND THE UGLY: Hotels and office towers built in the past couple of decades are totally unsympathetic to St. John’s simple, colourful box, maritime architecture. When will North American cities learn that it’s style, not volume, that makes a place rich! Thankfully the new art gallery sets an example for future development.